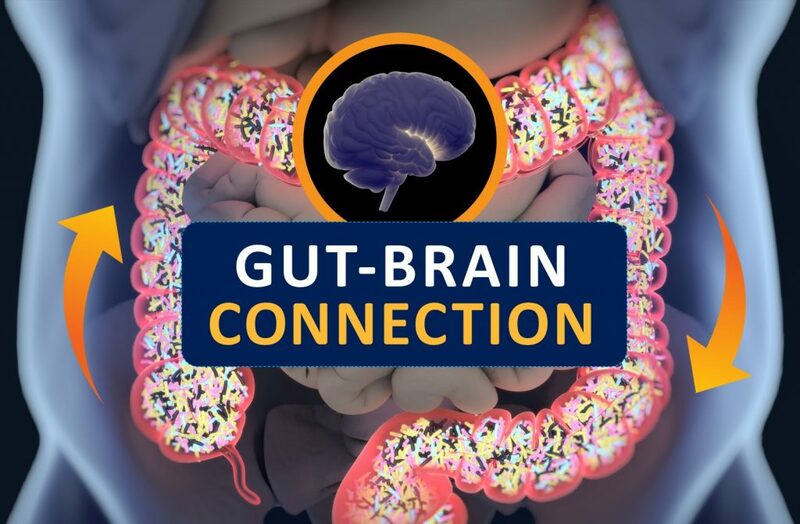 The gut-brain connection is scientifically proven to be real. Gut health is everything. Underlying microbiome and gastrointestinal problems such as leaky gut syndrome, SIBO, and candida overgrowth can be linked to just about every modern health problem. From weight gain and fatigue to anxiety and depression to autoimmune conditions and cancer, there are many consequences of having an unhealthy gut. We often use expressions like “gut-wrenching” experience, a situation that makes us “feel nauseous” or feeling “butterflies” in your stomach. These expressions are real, the gastrointestinal tract is sensitive to emotions. Anger, anxiety, sadness, euphoria — all of these feelings can trigger symptoms in the gut. The brain has a direct effect on the stomach and intestines. For example, the very thought of eating can release the stomach’s juices before food gets there. This connection goes both ways. A troubled intestine can send signals to the brain, just as a troubled brain can send signals to the gut. Therefore, a person’s stomach or intestinal distress can be the cause or the product of anxiety, stress, or depression. That’s because the brain and the gastrointestinal (GI) system are intimately connected. Given how closely the gut and brain interact, it becomes easier to understand why one might feel nauseated before giving a presentation or feel intestinal pain during times of stress. That doesn’t mean, however, that functional gastrointestinal conditions are imagined or “all in your head.” Psychology combines with physical factors to cause pain and other bowel symptoms. Psychosocial factors influence the actual physiology of the gut, as well as symptoms. In other words, stress (or depression or other psychological factors) can affect movement and contractions of the GI tract, make inflammation worse, or perhaps make you more susceptible to infection. Based on these observations we can understand patients with functional GI conditions might improve with therapy to reduce stress or treat anxiety or depression. And sure enough, a review of 13 studies showed that patients who tried psychologically based approaches had greater improvement in their digestive symptoms compared with patients who received only conventional medical treatment. To be diagnosed with an autoimmune disease, the immune system has to destroy a significant amount of tissue (such as the brain, gut, or thyroid) There has to be severe destruction of the neurological and digestive systems to be diagnosed with multiple sclerosis (MS) and celiac disease (CD), respectively. But of course, these diseases do not happen suddenly, This is the end stage of the larger autoimmune spectrum. Researchers are now proving food reactivities like gluten sensitivity are just one end of a larger inflammation spectrum, with autoimmune diseases like celiac disease (CD) on the opposite side. As mentioned there needs to be significant destruction of intestinal microvilli to be officially labeled as having celiac disease (CD). Moreover, only about 10 percent of people with CD have obvious GI symptoms; instead, they experience other seemingly unrelated symptoms like anxiety, depression, or skin problems. This leads to only 5 percent of celiacs ever being diagnosed! For these people, it can take up to six months just to bring down the autoimmune-inflammation antibodies of eating a gluten-containing food just one time! This is not even taking into consideration any other food sensitivity or health problem slowing down the gut-healing process. Most of my patients are dealing with one or more of these gut health, inflammation, autoimmune issues. I find clinically that while health improvements are seen remarkably, it’s really around the two-year mark that we see sustained and noticeable changes. If you have more complicated gut health issues, I encourage you to get a proper functional medicine workup and appropriate labs to get an idea of what you’re up against and to make sure you’re addressing everything you need to on your unique gut-healing journey. Healing your gut means healing your whole body. The surface area of your gut is around 300 square meters, which is the size of a house. These super-important gut-lining cells, called the enterocytes, are constantly regenerating and in a normal healthy gut, you have an entirely new gut lining every two to three weeks. The gut-healing time of people who don’t have autoimmune conditions, food sensitivities, or other inflammatory health issues varies, but studies suggest that it’s somewhere between two and 12 weeks. Another study from Harvard, published in the medical journal Nature, found significant changes in the makeup of the gut bacteria occurring just three days after a dietary change! This demonstrates the amazing power of the foods we eat, but in reality, most people interested in healing their gut have other health issues that make healing more complex and a lot slower. If you have one or more of these health issues, gut healing will definitely be a journey: chronic inflammation, Lyme disease, chronic viral infections, blood sugar issues, adrenal fatigue, SIBO, an autoimmune condition, histamine intolerance, candida overgrowth, or leaky gut syndrome. And to understand the issues above—and how they relate to your gut-healing journey—we have to understand something that we call the autoimmune-inflammation spectrum.